Thanks to Jacopo Amistani Guarda – from Open Source Ecology Italy – for linking me with Joe. 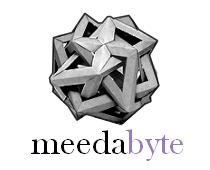 I’m sure that soon we will blog updates about his project to implement in Italy Bottega21 a venture based on the processes on which Joe, Wikispeed and OSE are working on these days. [Simone Cicero]: First of all, we would like to know from you directly what’s the status of Wikispeed, and get some info about the collaboration with Open Source Ecology. Also, in this framework, how’s the Extreme Manufacturing platform and process growing these days. [Joe Justice]: These are three questions back to back, let’s see if I can answer in an clear way. First of all, let me introduce Wikispeed in a one minute and a half version. Wikispeed builds ultra efficient cars and we do this with seven days development cycles using agile methodologies. Those methodologies include several aspects, for example about managing distributed teams – like with SCRUM – or methods to ensure an high quality bar and focused work – much like Extreme programming and Test Driven Development as part of XP – that we reworked for the manufacturing process labeling it Extreme Manufacturing. Traditional manufacturing runs in 3 to 25 years long development cycles: this means you can go to a Porsche dealer and buy a brand new Porsche 911 car and that would be the best engineers thought you might want 24 years ago and, if we stuck with this example, Porsche recently announced that the current Porsche 911 wil be with us for the next 14 years. In Wikispeed we are aiming for mass customization, very rapid development and technologies and efficiencies that haven’t yet existed, that are fully gamechanging and not just and incremental evolution of old and sometimes defunct technologies. To do that we iterate on seven days development cycles, that means that we can change every aspect of the car every seven days. This is possible through modularity: the car splits into eight modules that are loosely coupled so we can change one and not change the others. Wikispeed is missionized to rapidly solve problems for social good. We don’t just make cars. I recently gave a talk on methods for vaccine distribution to help eradicate Polio: we worked with a group that develops low cost medical centers and communites for this and we’ve done significant work with them. Currently, the status is that Wikispeed developed some efficiency proof of concepts: the best is a car that is secure and runs for more that a hundred miles per gallon but we launched an Indiegogo crowdfunding campaing (Ed: last night!) 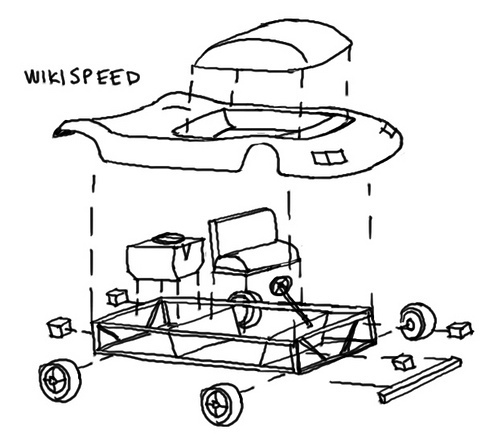 for Wikispeed to build commuter cars that people wants to drive every day and are ultra efficient and that can be manufactured at ultra low cost. We do this with OSE (Open Source Ecology). OSE gives us the platform to share ours designs, our budgets, our build practices and our maintenance videos with the world so that people can build their own ultra low cost commuter cars. Imagine in a world when your commuter car goes more than 100 Miler per Gallon in the United States cycles, that is about 1.5 liters per 100 km in Japan cycles for example, and imagine that you could maintain it by yourself – if you are inclined to do it – or that is very inexpensive to maintain if you’ve someone else to maintain it for you. Imagine it to be modular and changeable to follow your life changes, from a convertible to a sedan to a pick up truck, and that’s exactly what we’re bringing to everyone right now and OSE is giving us the platform to share it with as many people as possible. XM is the metodology to allow other business to make this changes as quickly as wikispeed is prototyping. XM is an agile methodology, it takes the best methodologies as applied by the best software teams and extrapolates them to make them applicable to every industry. In particular we’re applying this to R&D, physical engineering and physical manufacturing and we think that such a process can be used for finance, insurance, energy, law, community management, residential and commercial construction and other businesses as well. Extreme manufacturing takes the best practices for distributed team management, frugal engineering and frugal design and applies back to the physical world. The status of that is available on the wiki of OSE as it evolves and explained in videos and I think we’ll have a book and set of lectures soon. [Simone Cicero]: There’s a key passage in your introduction that is about the crowdfunding campaign on indiegogo you’re kicking off these days and is really the question: “Who’s gonna finance this”. I mean, this is a community driven approach and your project is actually fueled by volunteers: understanding the role of “capital”, of financing, and the investment phase needed is key to understanding what you can actually produce with this approach. [Joe Justice]: When you produce you need roughly three kind of things: materials, machinery, and person hours. We have volunteers for person hours, and we have donated machines and donated materials – or small amounts of capitals that led us to buy those. With the indiegogo capital campaign we are going to obtain more materials to be able to prototype more rapidly and increase our innovation pace, we are going to acquire faster machinery and that increases our pace of innovation again. We’re also going to be able to finance some graduate schools stipends – this is not a job, it pays too little for being it – that will allow this graduate school students to work almost full time with the team passionately and very quickly and this will end up in an increasing the number of iterations we can achieve, eventually increasing our pace of innovation once again. So you see capital helps us to improve in all the three things that team wikispeed uses to move more quickly and if you think that we’re already moving at a pace of innovation that – in some ways measuring it – is 10000 % faster than industry norms you can understand what we’re talking about. And we have lots of fun doing it! [Simone Cicero]: Amazing, we all believe that this wide efficiency differences will make this approach the winning one in the long term. The point is, thinking about the world in say five years, or at least in the future, when this will be potentially the de-facto standard, there will be way less profit in the world, and less traditional money involved in the production of goods isn’t it? [Joe Justice]: The direction we’re trending is that the same amount of profit will be generated in the world but will be generated by everyone, in a way that is more equitable – in an equitable distribution of wealth mode. So instead of us going into a traditional employer that keeps a larger percent of our work, and replicating the same approach with people that work under us – as a country we do it for counties that support us and they do the same for countries under them – instead of that, everyone will have an equitable share that is proportional to the amount of value he contributes to the world. We’re not there yet but we’re moving closer: open source hardware movements are making this more possible than ever before. In addition, with these open source movements, we’re innovating more quicker and that’s compatible with the current financial structure: this allows all companies to have product development cycles that are much more quicker than they are now. But then what we are seeing independently from that, is the democratization of precision tooling: when people can buy machines – or build their own – that have a level of quality that is comparable to mass manufacturing. Suddenly you have the opportunity for a garage manufacturing revolution where people can make a new type of shoes or a new type of car and actually make it via viable competitive components in the marketplace today and that decentralization of manufacturing starts with decentralization of the supply chain and of profiteering. And if the same level of profit exist in the world we have now the opportunity of equitably distribute that across the world, and the differences between a third world and a developed world country will then reduce. Certainly there’s the possibility that traditional big business can act to impede that but we didn’t see it until now, on the contrary we’re seeing encouragement by these businesses and political bodies: we’ve seen poor protectionism movements and instead more embracement because rapid development products are appealing. [Simone Cicero]: I’m not completely convinced that we can seek for embracement from the traditional economic structures since it seems to me that the inefficiencies in the production systems today have been crafted with the aim of actually generating profits from inefficiencies. The exploitation of inefficient work and your process are on very different sides: by increasing efficiency you make actually less work needed for doing things. Another implication of the theories and practices behing XM could be that there will be less paid work and much more socially contributed work and people will be much more involved in actually building and tinkering in the production of their own goods – so they will actually contribute “unpaid” work in directly into building their own things. This means that places where this kind of activities will happen locally are to appear in the future so probably there will be less factories and more labs where I can go and produce or repair things on my own. So the question is: how will these places be made, will they come out from the Fablabs/hackerspaces/makerspaces concept? [Joe Justice]: When we have things like Arduino, that is absolutely Italian – so you see Italy, as well as every country, is leading this revolution – and we have hackerspaces where people can create with Arduino and sister platforms – such as netduino – in the field of electronics; and we have Fablabs where people can go and produce physical equipments we are coming closer to the capabilities of traditional manufacturing. But there is a point you raised that I don’t see, at least in the nearest future: will traditional manufacturing disappear and will people be involved themselves directly in the manufacturing process of their own goods? There’s a trend towards localization and community availability of manufacturing that we haven’t seen since the trade guilds days – particularly in Europe – and with these available pieces of manufacturing like the Global Village Construction Set (GVCS), the hackerspaces and fablabs maybe someone in your community will build your next bread owen or window garden, your next cat feeder or your next pair of pants. It might not be you directly – since I’m not that savvy with sheet types, shape templates and so on to make excellent pants – but maybe someone in my community could go to the hackerspace or fablab and make a wonderful pair of cost competive pants and I might acquire those locally. So I dont’ see me making all the things I need, surely some – I make my own car now! – and by making this open source and modular, someone else can make it without going through the landscape of all, for example, the automotive problems: they maybe can just make a better seat belt – by iterating only the interior module – and make it available to the public domain. In other words you maybe will not be involved in producing your entire new car – at least not very soon – but everyone might be customizing it and some people maybe will be making some meaningful improvements and maybe everyone will be buying a locally crafted car that is made from locally sustainable materials in the local fablab. I do see this as a fairly near opportunity that will co-exist with traditional manufacturing and eventually be growing in market share. [Simone Cicero]: Do you think that we will be able to build everything with this approach? I mean, when I think to consumer electronics – for example cellphones – or to the next quad-core chipset I see very complicated processes. [Joe Justice]: Well, the GVCS, is made of fifty items, our car is just one of those, that represent all the items needed to grant the current level of comfort and livelihood, and once this will be complete – and this is being prototyped right now by OSE, headquartered in the Factor’e’Farm in Missouri in the US – people will be able to build almost everything. There’s not a machine to make cellphones in the GVCS but there’s a machine that can make CNC printed circuitboards and there’s a machine that can make injection molded cases and from those people can make their own cellphones. I was reading a blog before you and I talk, about people using a CNC printer – that cost about three hundred dollars to build – to print chips, whit two different printing heads one for plastics and one for circuitry. Obviously we can still not print core i7 miniaturized size circuitry but we are getting closer to this and by thanks to the open source community we’ll be able to iterate and improve so I do see us, able to produce our next quad core CPU and I do see us able to reduce and reduce and reduce the amount of energy needed to do this. [Simone Cicero]: Is there something we are used to have these days that is really hard to imagine to be operated in this cooperative and sustainable way. Let’s think about large chemical factories or planes, giant ships etc.. Is there any possibility that we’ll end up understanding that these kind of goods are not sustainable anymore and we should learn how to live without having access anymore to them in the future? [Joe Justice]: From my experience and understanding I share your view. Many consumption trends and lifestiles we have developed will be subject to radical change in case we want to inhabit the planet for more years in the future. We have been around since 250 thousand years and when the first home sapiens came out there were less than one million of us and about the same number of chimpanzees. Now we have around 600 thousand chimpanzees and more than six billion humans. Maybe the number of sustainable humans on the planet is about one million or even less – given the changes in the environment that we made so far – and we have now an elaborate network of machinery and chemicals extraction to provide for that number of humans. Unfortunately those processes are based on resources that are limited or, at least, that we consume with a pace that is faster than the pace those resources are replenished. We need absolutely to develop more energy and resource efficient ways of production and maybe local production and local manufacturing coupled with the international network of ideas is the solution to adapt to a more sustainable way of living. Maybe, thanks to open source development we can make a difference, instead of waiting that this solutions are developed in the closed of traditional businesses, and the important think is that we move in this direction, that is worth investigating. But back into your point, I don’t see us continuing living exactly as we do now, and replicating the exact same level for example of chemical processing or goods procurement, but I see the open source, local manufacturing and local sourcing processes making us able to iterate quickly enough that we may land in something sustainable in time to take care of our planet. [Simone Cicero]: It seems that, to enable these transition, we are going to create a substantially huge body of knowledge: we must improve almost everything and my question is about whose the owner of this body of knowledge that we’re going to create collaboratively. How will we manage this library of commons that will be used across the world to produce goods that we’ll be using everyday? Do you think that we’ll see, as it happens for the software, for example with the Mozilla, Apache or Linux foundation, not for profit institutions taking care of these design process phase enable us to design the next wikiboat, wikiwashingmachine and so on? What’s the role of these players? Apart from the design, the most important body of knowledge we’re building right now is the process itself. Imagine a world where everything we do takes 1% less time: waiting in the doctors office, filing our taxes, filling up gasoline in our car or in general, innovate in our lives. XM, by mutuating processes by the most performing software teams in the world, promises even a little bit more and developing this process might be our greatest social good. ultra efficiente utilizzando processi mutuati dallo sviluppo software, mondo dal quale Joe proviene. Oltre a essere un visionario, Joe è una persona fantastica e alla mano e questa intervista racchiude una discussione molto aperta e fruttuosa che ho potuto avere con lui alla fine di Aprile. Vi consiglio vivamente di leggerla perchè potrà esservi utile a capire in che modo la produzione – e il consumo – saranno destinati a cambiare nei prossimi anni se, come dice Joe, vogliamo continuare a abitare su questo pianeta per un po’. Ringrazio sentitamente Jacopo Amistani Guarda – di Open Source Ecology Italia – per avermi messo in contatto con Joe. Sono sicuro che a breve ospiteremo sul blog un aggiornamento sugli sviluppi del suo progetto Bottega21 di implementare in Italia i processi su cui Joe, Wikispeed e OSE stanno lavorando. [Simone Cicero]: Prima di tutto, vorremmo sapere da te Joe qual è lo stato del progetto Wikispeed, e ottenere alcune informazioni circa la collaborazione con Open Source Ecology (OSE). Inoltre, in questo quadro, quale è poi l’avanzamento dei lavori sulla piattaforma Extreme Manufacturing (XM). [Joe Justice]: Si tratta effettivamente di tre diverse domande: vediamo se riesco a rispondere in modo chiaro. Prima di tutto, vorrei permettetemi di presentarvi Wikispeed in una versione da un minuto uno e mezzo. La manifattura tradizionale vive di cicli di sviluppo prodotto che vanno da 3 a 25 anni: questo significa che si può andare ad un concessionario Porsche e comprare una nuova Porsche 911, un auto che rappresenta il meglio che gli ingegneri Porsche ritenevano possibile 24 anni fa e, se continuiamo su questo esempio, Porsche ha recentemente annunciato che l’attuale Porsche 911 starà con noi per i prossimi 14 anni. In Wikispeed puntiamo alla personalizzazione di massa, a uno sviluppo molto rapido e a tecnologie ed efficienze che non sono ancora esistenti, che sono pienamente gamechanging e non solo una evoluzione incrementale di tecnologie vecchie e talvolta già defunte. Per fare questo dobbiamo iterare i cicli di sviluppo su sette giorni, che significa che possiamo cambiare ogni aspetto della vettura ogni sette giorni. Ciò è possibile attraverso la modularità: l’auto si divide in otto moduli che sono debolmente accoppiati in modo che si possa cambiare uno e non cambiare gli altri. Wikispeed ha come missione quello di risolvere rapidamente i problemi per il bene sociale. Non ci limitiamo alle automobili: di recente ho tenuto una conferenza sui metodi per la distribuzione del vaccino per l’eradicazione della Polio; abbiamo lavorato con un gruppo di medici che sviluppa i centri a per l’assistenza a basso costo e le comunità che possono alimentarli e su questo progetto abbiamo fatto un notevole lavoro con loro. Allo stato, Wikispeed ha sviluppato una serie di proof of concepts: la migliore e più famosa è una macchina che è sicura e che fa più di un centinaio di miglia per gallone ma abbiamo appena lanciato (ndr: stanotte!) una campagna di finanziamento su indiegogo per permettere a Wikispeed di costruire automobili per pendolari che la gente voglia guidare ogni giorno e che siano ultra efficienti e fabbricabili a bassissimo costo. Lo facciamo con OSE perchè ci offre la piattaforma per condividere i nostri progetti, i nostri budget, e le nostre pratiche o i nostri video di manutenzione con il mondo intero in modo che le persone possano costruire le proprie vetture a bassissimo costo in altre parti del mondo. Immaginate in un mondo in cui la vostra auto per pendolari fa più di 100 Miglia per Gallone nei cicli di percorrenza relativi agli Stati Uniti, che corrisponderebbe a circa 1,5 litri per 100 km nel ciclo Giapponese per esempio, e immaginate che quest’auto si possa manutenere in autonomia – se si è inclini a farlo – o che non sia molto costosa da far manutenere a qualcuno che lo faccia per voi, come il vostro meccanico di fiducia. Immaginatela modulare e mutevole e capace di seguire i cambiamenti della vostra vita passando da una convertibile a una berlina o a un pick up: questo è esattamente ciò che stiamo cercando di portare a tutti in questo momento e OSE ci sta dando la piattaforma per condividere il progetto con il maggior numero persone possibile. XM è la metodologia per consentire alle altre imprese di fare questo cambiamento alla stessa velocità di wikispeed. XM è una metodologia agile: ci vogliono le migliori metodologie applicate dalle migliori squadre di svilippo software estrapolate per renderle applicabili a tutti i settori. In particolare stiamo applicando questi metodi alla ricerca e sviluppo, alla produzione fisica o all’ingegneria e pensiamo che una tale processo possa essere utilizzato anche per la finanza, le assicurazioni, l’energia, la legge, la gestione della comunità, l’edilizia residenziale e commerciale e anche altre imprese. XM adotta tutte le best practice per la gestione dei team distribuiti, i principi dell’ingegneria e del design frugali e le applica al mondo fisico della manifattura. Lo stato attuale è disponibile sul wiki di OSE nello stesso momento in cui si evolve, spiegato in video e credo che presto avremo un libro e una serie di lectures . Voglio dire, questo è un approccio guidato dalla comunità e il progetto è in realtà alimentato da volontari: la comprensione del ruolo del “capitale”, del finanziamento e la fase di investimenti necessari è la chiave secondo me per capire cosa si può effettivamente produrre con questo approccio. [Joe Justice]: Quando produciamo ci sono necessarie più o meno tre tipi di cose: materiali, macchine e tempo di lavoro. Abbiamo volontari per il lavoro, e ci hanno donato macchine e materiali – o piccole quantità di capitali che ci hanno permesso di comprarli. Con la campagna su indiegogo stiamo per ottenere più materiali che ci servono per essere in grado di prototipare più rapidamente e aumentare il nostro ritmo di innovazione, acquisteremo inoltre macchinari più veloci che aumenteranno ancora il nostro ritmo di innovazione. Stiamo, speriamo, per essere in grado di finanziare alcune borse di laurea: questo non è un lavoro, possiamo pagare troppo poco per esserlo, ma permetterà a questi laureandi di lavorare quasi a tempo pieno con la squadra con passione e molto rapidamente e questo finirà in un nuovo aumento del numero di iterazioni che possiamo raggiungere, aumentando il nostro ritmo di innovazione, ancora una volta. Quindi, come vedi il capitale ci aiuta a migliorare in tutte le tre cose che Wikispeed utilizza per innovare più velocemente e se si pensa che ci muoviamo ad un ritmo di innovazione che – per certi versi – è il 10000 % più veloce della norma del settore, credo tu possa capire di cosa stiamo parlando. E ci divertiamo un sacco a farlo! [Simone Cicero]: Incredibile, tutti noi crediamo che questo livello di differenze di efficienza rendano questo approccio vincente nel lungo periodo. Il punto è: pensando al mondo in diciamo cinque anni, o almeno in futuro, quando questo sarà potenzialmente un de-facto standard, è ragionevole secondo te pensare che ci sarà meno profitto nel mondo e che il denaro sarà meno coinvolto nella produzione di merci? [Joe Justice]: La direzione che stiamo prendendo è che la stessa quantità di profitto sarà generata nel mondo, ma sarà generato da tutti, in un modo che sia più equo – in una distribuzione equa della ricchezza. Così, invece di farci andare davanti a un datore di lavoro tradizionale che mantiene un per cento del nostro lavoro, e replicare noi lo stesso approccio con le persone che lavorano per noi – noi come paese lo facciamo per i paesi che ci sostengono e loro fanno lo stesso per quelli “sotto” di loro – ognuno avrà una quota equa di profitto, proporzionale alla quantità di valore che contribuisce al mondo (NDR: e alla sua comunità!). Non ci siamo ancora ma ci stiamo avvicinando. I movimenti legati all’Open Source Hardware stanno rendendo possibile questo ogni giorno di più. Inoltre, grazie al movimento open source, siamo in grado di innovare più velocemente e questo è compatibile con l’attuale struttura finanziaria: questo approccio permette a tutte le aziende di avere cicli di sviluppo dei prodotti che sono molto più rapidi di quanto non siano ora. Ancora, quello che stiamo vedendo in modo indipendente da tutto il resto, è la democratizzazione degli utensili di precisione: quando le persone possono acquistare le macchine – o costruire le proprie – con un livello di qualità che è paragonabile a quello della produzione di massa, improvvisamente si ha la possibilità di una rivoluzione manifatturiera che parta dai garage dove le persone possono creare un nuovo tipo di scarpe o un nuovo tipo di vettura ed effettivamente farlo tramite componentistica di mercato con prezzo concorrenziali. Oggi il decentramento della produzione inizia con il decentramento della catena di approvvigionamento e di generazione del profitto. E se lo stesso livello di profitto esisterà nel mondo insieme con l’opportunità distribuire tale ricchezza equamente in tutto il mondo, allora le differenze tra un paese del terzo mondo e un paese del mondo sviluppato sarà poi sempre più ridotta. Certamente c’è la possibilità che le grande aziende dell’establishment tradizionale possano agire per impedire tutto ciò che ma, finora, questo non lo stiamo vediamo: al contrario stiamo assistendo all’incoraggiamento da parte di queste imprese e istituzioni politiche e abbiamo visto poche mosse di protezionismo; piuttosto spesso questi player abbracciano e si interessano ai processi di sviluppo rapido dei prodotti. [Simone Cicero]: Non sono completamente convinto che possiamo cercare un supporto da parte delle strutture economiche tradizionali, poiché mi sembra che le inefficienze dei sistemi di produzione di oggi siano state creare ad arte, con l’obiettivo di generare più profitti. Dalle inefficienze, dallo sfruttamento di lavoro inefficiente si generano molti profitto. Il vostro processo invece opera in maniera molto diversa: rende in realtà meno lavoro necessario per fare le cose. Un’altra implicazione delle teorie e delle pratiche legate all’XM e da trend simili potrebbe essere, in futuro, la disponibilità di meno lavoro retribuito a fronte di molto più lavoro contribuito socialmente. Vedo un consumatore molto più coinvolto in realtà nell’armeggiare con la produzione e con la manutenzione dei suoi propri beni (NDR: in ottica Prosumer), in modo che effettivamente egli contribuisca con del lavoro – “non direttamente retribuito” monetariamente – nel costruire le proprie cose, i propri beni, direttamente. Ciò significa che i luoghi dove questo tipo di attività avverrà a livello locale dovranno necessariamente comparire e consolidarsi in un futuro dove ci saranno meno fabbriche e più laboratori dove io possa andare a produrre o riparare le mie cose in autonomia. La domanda è: come saranno fatti questi luoghi? deriveranno dai Fablabs/hackerspaces/makerspaces per esempio? [Joe Justice]: Quando abbiamo cose come Arduino, che è assolutamente Italiano – e questo vi fa vedere come l’Italia, così come tutti i paesi del mondo, stia guidando questa rivoluzione – e abbiamo hackerspaces dove le persone possono creare con Arduino e le piattaforme sorelle, come netduino, nel campo dell’elettronica e a questo affianchiamo i Fablabs dove la gente può andare a produrre apparecchiature fisiche ecco che notiamo che ci stiamo avvicinando alle capacità di produzione tradizionale. Tuttavia c’è un punto che tu hai sollevato e che io non vedo, almeno non nel futuro più vicino: tu mi chiedi se la manifattura tradizionale scomparirà e sarà la gente ad essere coinvolta direttamente nel processo di fabbricazione dei propri prodotti. C’è una tendenza verso la disponibilità e l’affermazione di una produzione localizzata e comunitaria che non vediamo dai tempi delle corporazioni commerciali (trade guilds) – specie in Europa – e se ci sommiamo i componenti di produzione disponibili tramite cose come il Global Village Construction (GVCS) Set di OSE, o gli hackerspaces e i fablabs e forse, piuttosto che tu direttamente sarà qualcuno nella tua comunità a costruire tuo prossimo forno per il pane o la tua finestra per il giardino, o la lettiera per il gatto o ancora il prossimo paio di pantaloni. Potrei non essere direttamente io – dal momento che non sono così esperto con gli stencil, i cartamodelli e così via per creare dei pantaloni che siano ottimi – ma forse qualcuno nella mia comunità potrebbe andare all’hackerspace o al FabLab e fare uno splendido paio di pantaloni dal costo competitivo che potrei acquistare a livello locale. Così io forse non mi vedo a fare tutte le cose di cui ho bisogno, ma sicuramente un po’: per ora sto costruendo la mia auto, e poiché sto facendo questo in maniera open source e modulare, qualcun altro può potrà farlo senza passare attraverso tutti i problemi, per esempio dell’industria automobilistica, che io ho già affrontato: magari può fare una nuova cintura di sicurezza migliore – iterando solo il modulo degli interni – e renderla di pubblico dominio. In altre parole forse non saranno tutti coinvolti nella produzione di auto completamente nuove ma tutti potrebbero essere interessati alla loro personalizzazione. Alcune di queste persone forse faranno miglioramenti significativi e a tutti sarà possibile l’acquisto di una macchina costruita localmente e artigianalmente, fatta da materiali localmente sostenibili nel FabLab locale. Per finire direi che vedo questa come un’opportunità piuttosto vicina che coesisterà con la produzione tradizionale e, infine, crescerà in termine di quota di mercato. [Simone Cicero]: Pensi che saremo in grado di costruire di tutto con questo approccio? Voglio dire, quando penso all’elettronica di consumo – i telefoni cellulari ad esempio o magari il prossimo quad-core chipset – vedo processi molto complicati che necessitano di capitali e infrastrutture notevoli. [Joe Justice]: Beh, il GVCS, è fatto di cinquanta elementi, la nostra macchina è solo uno di questi, che rappresentano gli elementi necessari per garantire l’attuale livello di comfort e mezzi di sussistenza e una volta che questo sarà completo – è in fase di prototipazione proprio adesso da OSE, nella Factor’e’Farm nel Missouri negli Stati Uniti – le persone saranno in grado di costruire quasi tutto. Non c’è una macchina per fare cellulari nelle GVCS ma c’è una macchina CNC che può fare circuitboards stampate e un’altra che può fare injection molding e, tramite queste macchine, le persone potranno costruire i loro telefoni cellulari personali. Stavo leggendo in un blog prima di parlare con te di persone che utilizzano una stampante CNC – che costa circa trecento dollari costruire – per stampare chip grazie a due testine di stampa differenti, una per la plastica e una per il circuito. Ovviamente non possiamo ancora stampare circuiti simili all’intel corei7 a dimensioni miniaturizzate, ma ci stiamo avvicinando e grazie alla comunità open source saremo in grado di iterare e migliorare così velocemente che mi fa pensare che saremo senz’altro in grado di produrre il nostro prossimo chip quad-core e penso inoltre che saremo in grado di ridurre, ridurre e ancora ridurre sempre di più la quantità di energia necessaria per farlo. [Simone Cicero]: C’è qualcosa che siamo abituati ad avere in questi giorni che è davvero difficile immaginare gestito in questo modo cooperativo e sostenibile? Pensiamo a grandi fabbriche chimiche aerei o grandi navi, ecc… C’è qualche possibilità che finiremo per capire che questo tipo di prodotti o servizi non sono più sostenibili e dovremmo imparare a vivere senza più avere accesso ad essi in futuro? [Joe Justice]: Dalla mia esperienza e comprensione condivido la tua opinione. Molte tendenze di consumo e stili di vita che abbiamo sviluppato saranno soggetti a un cambiamento radicale nel caso in cui vogliamo abitare il pianeta per molti anni ancora nel futuro. 250 mila anni fa, quando il primo homo sapiens è nato c’erano meno di un milione di noi e circa lo stesso numero di scimpanzé. Ora abbiamo circa 600 mila scimpanzé e oltre sei miliardi di esseri umani. Forse il numero di esseri umani sostenibili del pianeta è di circa un milione o anche meno – in considerazione dei cambiamenti che abbiamo apportato nell’ambiente finora – e abbiamo sviluppato una complessa rete di estrazione di prodotti chimici e una complessa rete di macchine per permettere a questo enorme numero di esseri umani di sopravvivere. Il problema è che questi processi si basano su risorse che sono limitate o, almeno, che consumiamo con un ritmo che è più veloce rispetto al ritmo con cui tali risorse vengono reintegrate. Abbiamo bisogno assolutamente di sviluppare modi di produzione più efficienti in termine di energia e risorse e forse la produzione locale insieme con la rete internazionale di idee è la soluzione che più ci permetterà di adattarci a un modo più sostenibile di vivere. Forse, grazie allo sviluppo open source, possiamo fare la differenza, invece di aspettare che queste soluzione siano sviluppate nel chiuso delle imprese tradizionali o dai governi, e l’importante penso è che ci muoviamo in questa direzione, che vale la pena indagare. Ma torniamo al tuo punto originale: non ci vedo continuare a vivere esattamente come facciamo ora, replicare esattamente lo stesso livello ad esempio di trattamento chimico o consumo di beni, ma vedo i affermarsi processi open source, di produzione locale e di sourcing locale, che ci renderanno in grado abbastanza rapidamente di arrivare a qualcosa di sostenibile nel tempo per prendersi cura del nostro pianeta. [Simone Cicero]: Sembra che, per consentire questa transizione, stiamo andando a creare un corpo sostanzialmente enorme di conoscenza: dobbiamo migliorare quasi tutto e la mia domanda è su chi sarà il proprietario di questo corpo di conoscenze che stiamo andando a creare in modo collaborativo. Come possiamo gestire questa biblioteca di commons che verrà utilizzata in tutto il mondo per la produzione di beni che verranno utilizzati da tutti, tutti i giorni? Pensi che vedremo, come accade per il software ad esempio con Mozilla, Apache o Linux, Fondazioni non profit prendersi cura di queste fasi del processo di progettazione che ci consentirà di progettare la prossima wikiboat, wikiwashingmachine e così via? Qual è il ruolo di questi player? Oltre al design, lo strumento di conoscenza più importante che stiamo costruendo in questo momento è però il processo stesso. Immaginate un mondo in cui tutto ciò che facciamo richieda l’1% in meno di tempo: l’attesa nello studio del medico, la dichiarazione dei redditi, fare benzina nella o in generale, creare l’innovazione nella nostra vita. XM, con i processi mutuati dai team di sviluppo software più performanti del mondo, promette anche un po ‘di più e lo sviluppo di questo processo potrebbe essere il nostro più grande bene sociale per il futuro. Se l’intervista ti è piaciuta dovresti seguirmi su twitter qui! Great article which shows a depth analytical approach to understand what is behind us and what happening. And last but not least a great hope for the future. Great approach, definitively this kind of approaches: open hardware, open project, open design… will lead the future. Spreading the knowledge, this works! I use vertical engineering, fast prototyping and similar techniques everyday and this is a good way also for companies! Interesting endeavor for sure, I have been following the RepRap project for a number of years and am a home CNC machine enthusiast. Perhaps “printing” the frame and skin might be another direction to consider. I know opinions are like… and everyone has one. I think they are actually looking after this kind of thing for the C3. Joe Justice vehicle never accomplished 100 MPG in fact never more than 69 MPG. He is complete “Con Artist”, do the research at X Prize no one was awarded 10th place. check out EPA no rating for Wiki Speed SGT-01 and no record at Roush Industries of any tested vehicle over 100 MPG, never did Wiki Speed accomplish more than 69 mpg. Joe Justice, has never been questioned and never had to prove his claims. He has Misrepresented himself and vehicle’s accomplishments. He has taken over $500,000 in various donations when all is based on lies, misrepresentations and border line “Pre Meditated Fraud”.